This fabulous map was published around 1903, shortly after the Boer War, and shows all the completed and under construction railways at that time. 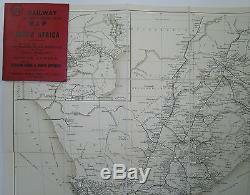 It is undated but the map tells us a great deal: The line from Pretoria to Pietersburg is shown as complete and so it must be at least 1899. Parts of the line from Harrisburg to Kroonstad are shown as'under construction' placing it earlier than 1906. The line to Modderport is also shown as'under construction' and this line was completed in 1904. The line to Hopefield was completed 28 Feb 1903. And this is shown as complete on this map. The map is dissected into 18 panels and mounted on linen. Bound in red buckram-covered boards with advertising for Thomas Cook on front and inside front cover. If for any reason you are not happy please let me know and I will sort it out. 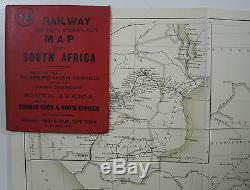 The item "C1903 Old Antique Bain's Railway Post Cart & Steamer's Route Map of South Africa" is in sale since Tuesday, October 16, 2018. 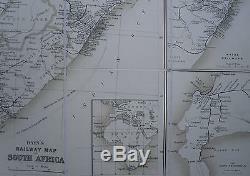 This item is in the category "Books, Comics & Magazines\Non-Fiction\Maps & Atlases".oh" and is located in Parracombe. This item can be shipped worldwide.